Here’s my version of Caprese and Bruschetta meeting together on a bed of Romaine lettuce. Plus it’s easy to make. Caprese salad is a delicious tomato salad. Use quality ingredients to really make this dish shine. Use the ripest of tomatoes, the freshest of mozzarella and fragrant basil. There is really no “one way” to make this simple salad…it’s very versatile. Even the amount of the ingredients are more of a guideline. Portions, omissions and additions totally depend on your individual taste. 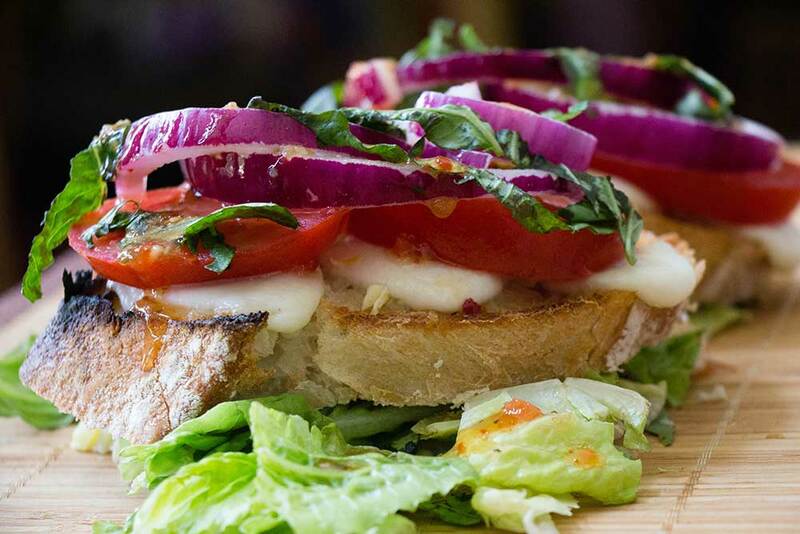 Bruschetta are traditionally made with stale bread, and for good reason. When you toast stale bread it’s a bit harder, which makes it able to stand up to wet ingredients like juicy tomatoes, olive oil and dressings. Cut bread on a bias in thick slices. Place under the broiler. Brown. Take out of oven and turn bread over. Drizzle with olive oil and sprinkle with minced garlic. Place mozzarella slices on top of the olive oil and garlic. Place under broiler and melt cheese. Place sliced bread with the melted cheese on a bed of lettuce. Top melted cheese with tomato slices, onion slices and basil.